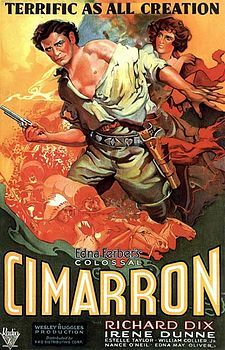 Cimarron (1931): Dir. Wesley Ruggles. Written by: Howard Estabrook, with additional contributions by Louis Sarecky. Based upon the novel of the same name by Edna Ferber. Starring: Richard Dix, Irene Dunne, Estelle Taylor, Nance O’Neil, and George E. Stone. Unrated. Running time: 123 minutes. As the first Western to win Best Picture, Cimarrron starts out strongly enough—flimsy pioneer wagons tear up the Midwest plains in the Oklahoma Land Rush of 1889. Conveying the openness of the Oklahoma prairie, the film promises to be a rousing adventure—but settles for a somewhat disjointed family saga. Lawyer, newspaper editor, and expert marksman Yancey Cravat sets out for the town of Osage with his wife Sabra and son Cimarron in tow. Through the years, Yancey frees the town from outlaws, but his insatiable wanderlust threatens to upset the stability of his family. While boasting some impressive art decoration and fitting performances from Richard Dix as Yancey and Irene Dunne as Sabra, the film starts to get boring around the halfway mark. It lacks a consistent or evenly remotely formidable adversary for Yancey, who channels Jesus Christ or Chuck Norris as the situation arises. Little if any moral ambiguity exists in the film, and the little that remains is quickly brushed aside. It would much rather deify its hero, squandering the chance for an interesting character study. Compound that with some embarrassing racial stereotypes, and it’s easy to see why the film hasn’t aged well. Cimarron deserves some merit for its portrayal of Native Americans as actual people (take that, Stagecoach! ), but the film proves nowhere near as bold as its protagonist.